A family of paddleboarders is both a beautiful thing and a big investment. If you’d like to get everyone into SUP but a board per person is too pricey, there is an answer: get a tandem paddle board! Even if price is no obstacle, 2 person stand up paddle boards are a great option. They are practical for young families with children who can not yet operate a board alone. Partners who want to horn in on your paddling time will thank you too. The main difference between a tandem board and its single paddler brethren is size. Boards that accommodate 2 or more paddlers need to be longer and wider to be stable. Longer boards without increased deck width (think race boards) will feel wobbly under foot for anyone. Add a second person or more, and the difficulty with balance will only increase. It can be difficult to sneak away for a solo paddle if you’ve got a partner much less kids. 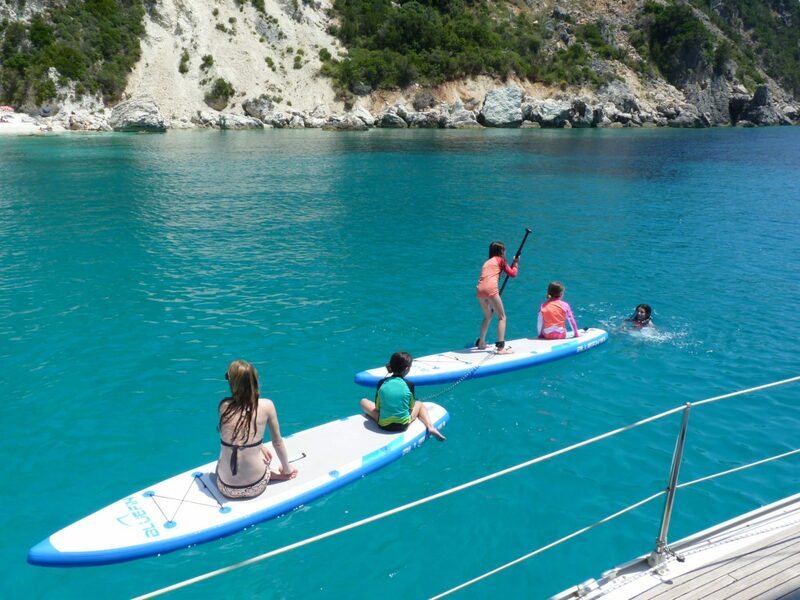 A board that you can paddle together provides a floating platform for family unit fun. Check the wind forecast in addition to the weather. A surprise gale is no fun with a toddler aboard. Bring along toys to keep your child occupied. Viewing windows are a great way to keep any little kid entertained for ages. This is especially true if you are paddling through shallow or clear water. Chart your trip through an area without a load of motorised marine traffic. Navigating waves will be risky with your precious cargo. Get junior a wetsuit and let them take a dip periodically on your journey. Attention span is everything so making the trip fun, breaking it into pieces is key. Plot your starting point carefully. Tandem boards are bigger and therefor heavier. Even the best inflatable tandem iSUP will be cumbersome if you have to hike 12 miles with your kids to launch. Inflation will take slightly more time because tandem boards hold more air. Be sure you and your partner are on the same page about who carries what (or who) and who pumps the iSUP. 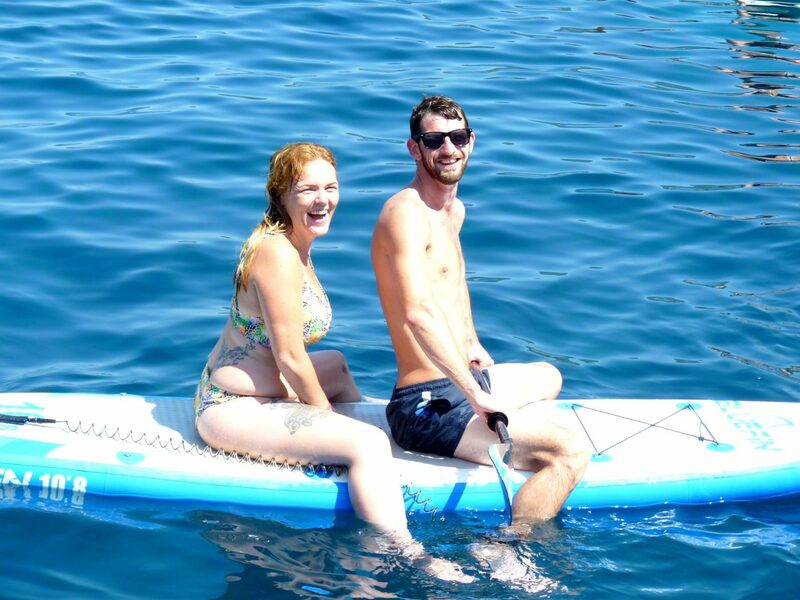 What better way to paddle more than to trick your partner into it? Not only will you spend more time together, your SUP obsession will have the green light. If your partner isn’t as fit as you are, no problem. A good 15’ board is still manageable to paddle on your own while your other half takes a rest. They can also paddle while kneeling or even seated in order to build up stamina and strength. None of your friends have their own board? No problem! A lot of people are hesitant to invest in new sports so giving them a taste on your own tandem will expand your options for socialising. Let’s face it, dinner & drinks gets boring after a while. Getting friends into paddling will allow you to hang out and exercise at the same time while not destroying your Sunday. 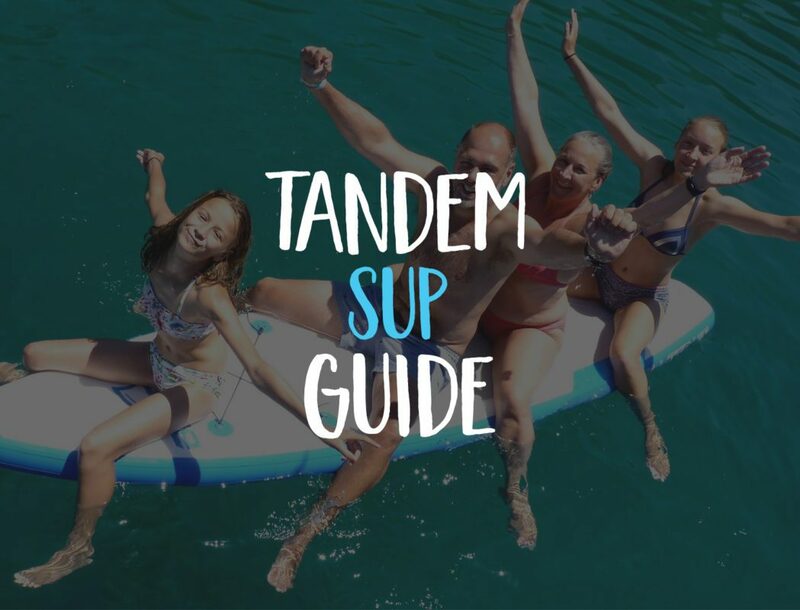 If your offspring hasn’t made eye contact with you since their 13th birthday, a tandem board is a great ice breaker. 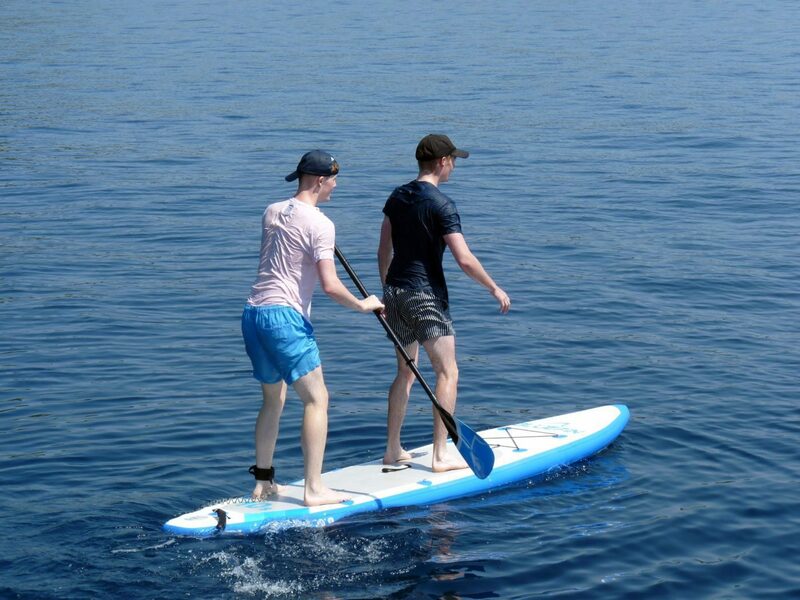 Paddle boarding is trendy enough to catch a teen’s attention and sharing a SUP means quality time is a condition! Paddling in pairs brings several new challenges. Longer boards are more difficult to manoeuvre. Turning can feel easier from the front rather than the rear of the board. Dig your paddle in on the side you’d like to turn to and pull hard. Downwind runs will feel different and cross winds will require considerably more effort to resist. To be efficient to the max you’ll also need to sync your stroke. Although stand up paddling is very different from crew or kayak style rowing, the techniques for rhythm and staying straight still apply. Position. stagger yourselves on the board so that you don’t smack each other with your paddles unless you mean to. Don’t stand so far forward or back so that your toes are on the edge but don’t cram yourselves in the center. Comfortable staggering will come naturally once you’ve spent a little time on your board. Don’t zig zag. As when SUPing alone, 4 or 5 strokes on one side before switching should keep you in a straight line. Time your strokes out and don’t paddle erratically. If it helps, you can start by counting your strokes out crew style. The Catch. The beginning of the stroke where you spear the water with your paddle is essential for generating power. Your ability to do this at the same rate will be essential to staying straight and developing speed, if you want to. Rhythm paddler in front. The person in front is the rhythm paddler if for no other reason than they can’t see you. If you are in back, try to match their stroke. Corrective strokes.If you are in back don’t worry because your job is still important. If the rhythm paddler is the lead guitarist, you are the drummer. You’ll be making corrective strokes as needed to stay the course straight and acting as a rudder. Passengers & Cargo. If you’re carrying gear, you should have room to stow some on the nose and tail even with 2 adult paddlers on a 15’ SUP. The best place for your pet or child is the center of the board where you can keep an eye on them. Again, there will still be room for gear in the center of the board so long as you are packed for a day trip. With multiple people on a board, buoyancy and stability are more important than ever. Look for a board that is around 15’ long and 35” wide. Many tandem boards will be higher off the water than short ones are. This is to provide more air volume and therefore a higher weight limit. Buoyancy and balance don’t need to be a compromise though. Don’t worry about the exact number of litres of air that a board can hold. Instead, concern yourself with a board that won’t be so high up that you are balancing on a wobbly tower. There are boards made for more than two people if going out in groups appeals to you. Group paddling can be a load of fun and in the case of an 18’ SUP you can practically plan your family reunion around it. What size tandem SUP is best for tall people? If you are over 6’ tall, a 15’ SUP will be plenty comfortable for you to paddle alone. It will still give you enough space to add a second paddler so long as your weight combined does not exceed the weight limit of the board. If both paddlers are extremely tall and extremely heavy with a combined weight of over 200 kg, more board will be more comfortable. A group SUP in the 18’ range is a more practical option for pairs of big boned water people. What can you do with a tandem paddleboard? Easy days out are great fun on a tandem SP. If you live near the water or a canal, a casual weekend toodle around is a real pleasure in any season. Work out days for the paddling duo that wants to spend time and burn calories. If you have access to a body of water where you can get speed up, tandem board is a great way to get in shape together. Touring on a board for 2 is a wonderful way to spend weekends or even holidays. There are endless options for happy tandem touring on a SUP. Putting in the miles on your paddleboard doesn’t have to entail roughing it. If you’re not into camping, plot your SUP tour holiday through an area you can access public transportation & airbnb. Surfing tandem is not for the faint of heart but it is exhilarating and definitely done. This takes far more skill and agility for 2 people to do on one board so give yourself time to start carving together. Yoga on a 15’ tandem is very doable in pairs so long as your practice is designed for partners. Otherwise, for standard flow based yoga 2 people or more would do better on a group paddle board. Tandem SUP racing is an awesome way to break into the sport together. There are tandem classes in many SUP races and even on a casual basis this is worth trying out together. You don’t have to be a sponsored pro to play. If you are still up in the air about putting 2 people on a stand up paddle board, try looking for a school in your area to test it out. You’ll be surprised how quickly you get your sea legs and have a rip-roaring good time. Activity Holidays Greece provided us with loads of photo inspiration for this post. We highly recommend booking a holiday with them if you’d like to spend your time exploring the med! This entry was posted in SUP Blog, SUP Tips. Bookmark the permalink.